In a show book-ended with two more “Tweezer Reprises,” the band dropped a very Phishy affair in upstate New York last night to opening SPAC’s two-night stand. 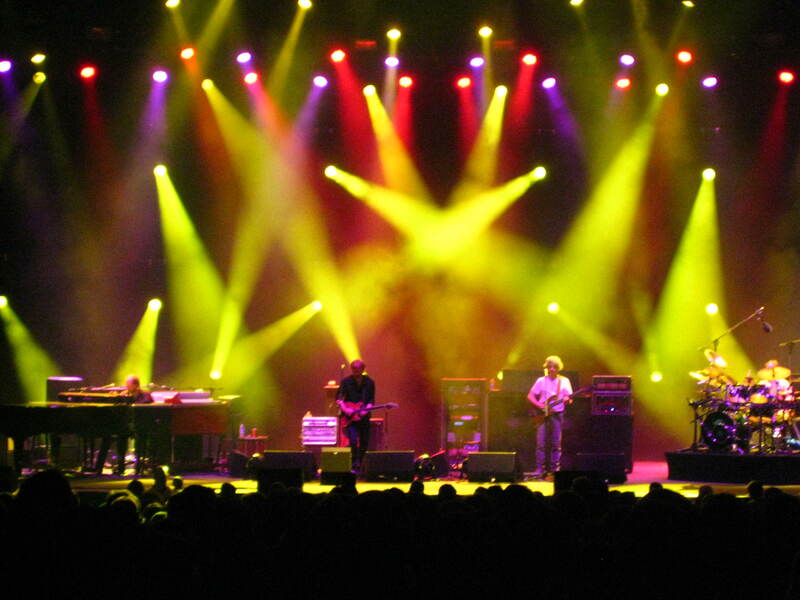 With a first set of early classics and a diverse second half composed of multiple segments, each carrying distinctly different vibes, Phish patched together an impressive evening of music. Suffering from a tad bit of choppiness, the second stanza did manage to maintain a flow from beginning to end, filled with this summer’s locked and loaded jamming, the band’s most promising debut this year, and one of the more exploratory jams of the summer. Sparking the show like a Phillies Blunt, Phish came out in comedic and invigorated form with the third version of “Tweezer Reprise” in a row- “Threeprise!” After capping Hartford with the now-legendary double -“Reprise” encore, the band couldn’t get enough blasting into the freezer for a third consecutive time. Surfing a tsunami of energy from Hartford, the band crashed into a second-song “Chalk Dust,” maintaining the initial intensity. The first set quickly adopted an old-school theme with a series of classic early-90s pieces; each musical link in the first set chain carried its own weight, with the improvisational highlight coming in the late-set “Bathtub Gin.” While not in the same league as the Virginia version, this one nonetheless carries thick groove of its own. Additionally, the bust out of “Yamar” brought a quintessential summer vibe to the set, providing the stage for some percussive full-band interplay. 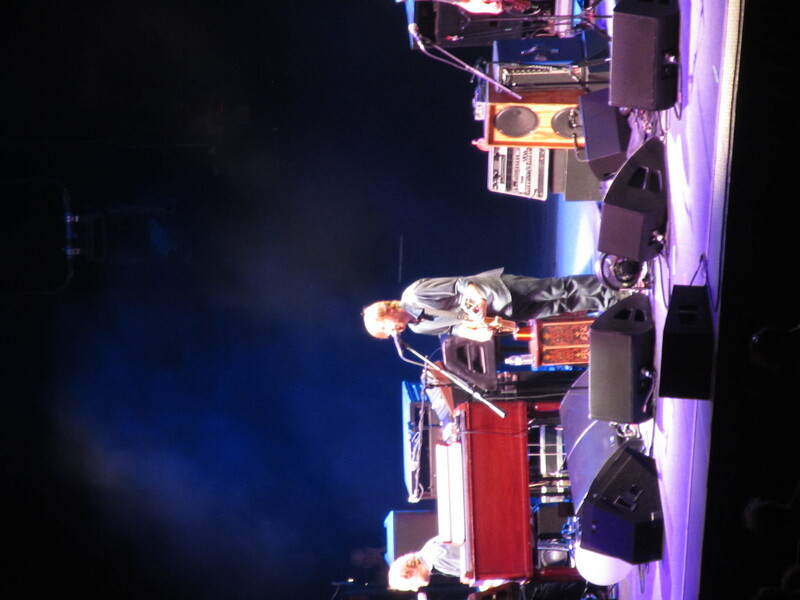 Call it the whale, call it what you will, Trey’s new style and tone – on full display in “Bathtub Gin” – and just about every other jam of the evening, has taken over his playing. And I must say, I am in love with the whale. Offering a new twist on Trey’s ideas, his pitch bending, sustained notes provide a more laid-back feel to his leads, bringing a completely new guitar element to the mixture. Often beginning in the background with gentle whispers, this minimalist approach not only provides the band with a new sound to build around, it allows Mike to step up as the bold, bass-wielding co-leader of every jam. The combination of these two elements have certainly carved out a new summer sound, but more on the 2010 sound come an off-day. Right now, let’s get to the second set. As Phish continues their re-evolution, the next logical step will be regaining comfort pushing their music into exploratory realms once again. Even in some of the summer’s most eventful sets, Phish has remained anchored to their song structures, sculpting full-on, energetic jams whose creativity come from the band’s natural chops rather than leading their music outwards. With last night’s “Rock and Roll,” Phish took his a step in the right direction. As the band left the song for the “Saratoga Jam,” their music became more open-ended and psychedelic than it has since Hershey’s “Drowned,” and they took this jam even further. With Mike at the center, the band passed through a slower groove of beauty into an exploration of faster textures, pushing their music without falling prey to typical cliches. Providing the most rewarding part of the evening, the second set opener took us for the most adventurous journey of tour. The multi-dimensional piece could have withstood another few minutes of exploration of straight psychedelia, yet still concluded organically. 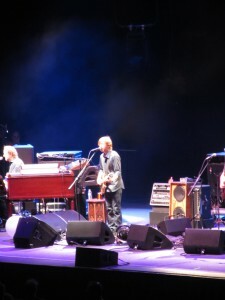 Ending in a tasteful pass into “Free,” Trey and Mike seemed like they were about to take the song for the elusive ride through a crunchy dungeon that we’ve all been waiting for. Leaving the bass solo behind, they set up a groove before making that damned chord change signifying the ending just as the piece set its course set for darker realms. Following this opening sequence, Phish dropped a meaningless “Number Line” in the middle of the second set with no improvisation. 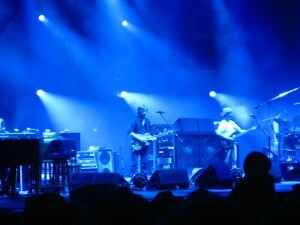 Playing the contained radio single for the Saturday night crowd, Phish deflated the set’s initial peak rather quickly, but when the band started up a slow, unknown groove, things got very interesting. Only after the show did we learn the title of Page’s “Halfway to the Moon,” but for the time we became engulfed by the sinister molasses of Phish’s most promising new song. With a particularly foreboding groove and tar-thick, “Moma”-esque bass patterns, this piece foreshadowed nothing but greatness in its world premiere. With an evil, yet funky launchpad, look out when this one opens a second set later this summer; the potential seems off the charts. But when Trey decides things are over, things are over. And such was the case as the band sat on the brink of something greater when he hacked into the growing piece with “Prince Caspian.” For a band that communicates so well while improvising, Trey could alert his band mates to his intentions when he wants to change a song; but in an all-to-characteristic move, Big Red lopped off another exploration without notice. Though Phish played a solid “Caspian,” the sudden change jerked the set’s momentum like a 747 hitting a large pocket of turbulence, and the lull continued through “Joy.” But everything shifted back into high gear for the show’s conclusion. Getting visibly excited throughout the into to “Bowie,” Trey flashed the double-heavy metal horns before dropping into the most scintillating version we’ve heard since their return. One-upping Chicago’s first-set closer with heavy grooves and series of blissful peaks, this version got the show back to a torrid level of intensity, while reminding is what is possible from a song that lied dormant for quite some time. The phenomenal version presented itself as the set-ender, but Phish went on to punctuate the frame with their newest cathartic closer, “Show of Life.” Infused with an enhanced energy, the anthem’s growing potential for transcendence continued to unfold in the song’s second incarnation. One had the sense that a final “Reprise” might have been coming as the band remained onstage during Page’s “Coil” solo, and after a boisterous stop in “Character Zero,” that is exactly what went down – the fourth “Tweezer Reprise” in two nights! This final helping of musical gusto carried everyone into a beautiful New York night with nowhere to drive, as Sunday night’s weekend closer loomed large. As the tour approaches its halfway point, things are only getting better. Stay tuned – same bat time, same bat channel. This entry was posted	on Sunday, June 20th, 2010 at 4:33 am	and is filed under Uncategorized. You can follow any responses to this entry through the RSS 2.0 feed. Both comments and pings are currently closed. ^and typing it as well, I suppose. 6/17 shine a light — well played inspiring. trey’s voice sounds warm and soothing. night folks. facing some serious music tomorrow, not he good kind. imagine you put in countless hrs. tryin to make $ and you get the exact opposite result. dang. RE: whale – its just overused. He’s pushing it a bit too much. A couple times a night he crushes it. There’s just no need to use it for Kill Devil Falls or Reba IMO. 2 cents. Thanks, BTB. when all us fails, we BBer’s have each other and phish to pull us through. peace out. Night all. Hope to see some of you in Mansfield. I’ll be rockin’ it in Section 8. Perhaps the market has heard that PHiSH is killin’ it all over town and rebound. Mound on Tuesday. Crosseyed and Painless too. The Ghost of Ted Williams, perhaps? We shall see. Good chatting with ya’ll tonight. Show looks ill on paper…can’t wait to hear it. 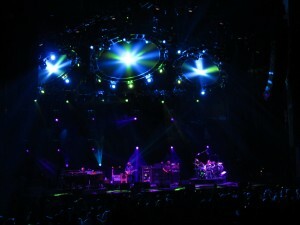 Sweeeeet a new Carini to measure against Chicago ’09. Endures as one of my favorite Phish lyrics of all time….if that’s what they’re saying. Crossing my fingers, checking my finance box tomorrow. Chance of Raleigh>Charlotte for me. At any point during 3.0, have you considered not doing full tours? I’m not trying to make a point here, just interested in knowing if its still getting you where you want to be. I dunno, Mr. Miner, Trey’s new tone sounds kind of tinny to me. I miss the more full-bodied tone of Trey 1.0. Powered by WordPress v 5.1.1. Page in 0.640 seconds.